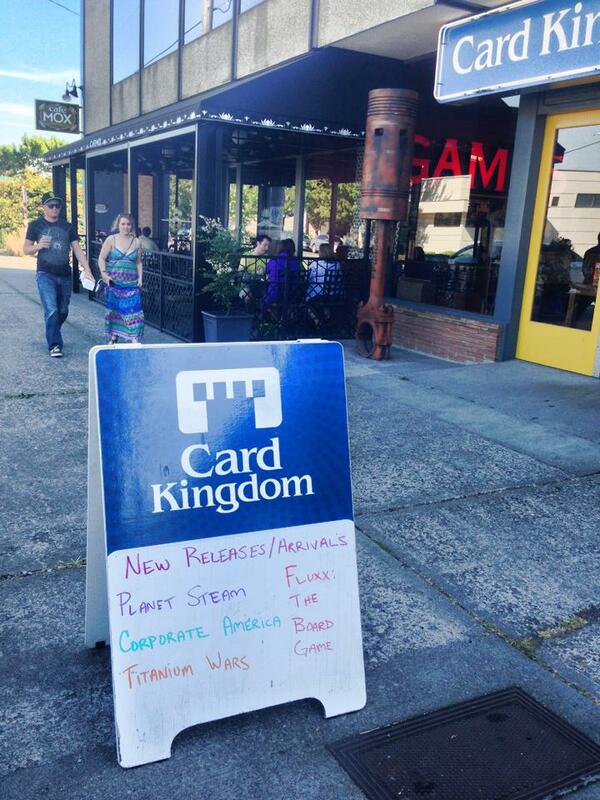 Corporate America arrives at Card Kingdom in Seattle. Photo courtesy of Andrew Federspiel. Corporate America started hitting the mailboxes of Kickstarter supporters and the shelves of game stores back in July of 2013. Eight months later, you might be wondering… how’s the game doing? The short answer, I’m happy to say, is pretty well! I recently went over the many positive reviews the game has received, and today I’ll cover how the game is selling. Before you get your hopes up too much, I should warn you that the information I get on sales is pretty minimal. It also comes quite delayed: figures for one month don’t come until half way through the following month. And that’s assuming they come on time, but they often don’t. For example, I still don’t know sales figures from January. 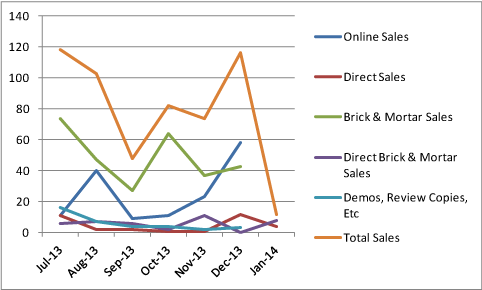 Corporate America sales breakdown, July 2013 to January 2014. Here, “Direct Sales” and “Direct Brick & Mortar Sales” are sales that I, your humble salesman extraordinaire, made myself. The other categories are from Game Salute. January 2014 looks pretty bleak, but that’s because Game Salute has yet to give me the figures for the month. Sales almost certainly went down from December, but I’m sure there were some. July incorporates a handful of preorders that were made in the months leading up to the game’s release. Brick & mortar sales were made to local game shops. I hope the shops then went on to sell the games to players, but I don’t know for sure how the games fair after arriving on shelves. I can only speculate about most of these numbers. But I do have some theories. Game Salute announced the game’s availability in July, which explains the high number of brick & mortar sales that month. Some game stores will pick up anything Game Salute releases, so these stores got several copies of the game to stock their shelves. In August, word of the game’s release started to reach gamers throughout the internet (probably mostly through Tom Vassal’s review), which explains the spike in online sales that month. I’m not sure about the spike in brick & mortar sales in October. Perhaps the first round of games sold out, so shops needed to restock their shelves? Or perhaps word that the game can actually sell started spreading to new shop owners? I’m not sure. I had a lot of success selling the game to brick & mortar stores in November because I did a lot of traveling. Online sales in December were very good due to a combination of Christmas gifts and the many online reviews that went out around that time. You’ll recall from previous posts that 1630 copies of Corporate America exist. Of that total number, how many have been sold? Total Corporate America sales, January 2014. 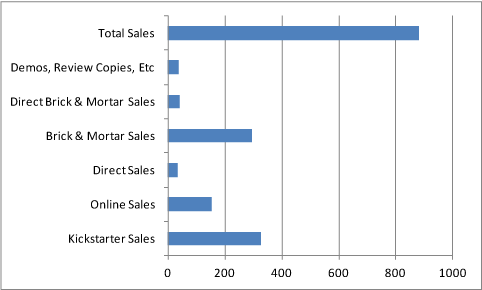 Again, this graph does not include most of January’s sales because I still haven’t received those figures. The first thing you’ll notice is that more than half of the games have been sold! For just over six months, I think that’s great. It’s very likely that sales will slow down, but my hope is that word of mouth keeps copies moving. 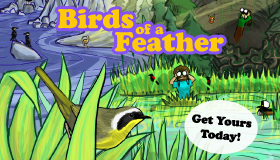 The next thing you’ll notice is that so far, nothing beats Kickstarter sales. Brick & mortar sales will probably overtake them soon, but Kickstarter is still the top driver of sales. They also happen to be the most lucrative sales for a publisher, emphasizing the need to make sure your Kickstarter is as successful as possible. As I prepare to Kickstart my next card game, this is very much on my mind. If you read my post on the cost to produce the game, you’ll remember that I had to spend quite a bit of money out of pocket to make Corporate America a reality. $9,500 or so, in fact. So… have I recouped my losses yet? As a matter of fact, yes! But just barely. January sales from Game Salute should put me into the realm of profitability, but it still took six months of pretty good sales to make up the money I spent to make the game. The good news is that from here on out, any Corporate America sales are pretty much pure profit! And since there are still 700+ copies of the game to sell, there’s potential to make a decent chunk of change. I’m happy to say that Corporate America has been selling about as well as I could hope. After seven months of sales, the game has sold many copies and promises to continue. Selling out of the first print run even seems like a possibility! Who knows, maybe by the 2016 presidential election, another print run will be in order? After all, I’m sure Citizens United v. FEC won’t be overturned by then or anything. While I’m extremely pleased with how Corporate America has done, I have also learned a lot from my mistakes with the game. I was overly ambitious with it as a first board game. Costs were higher than I expected, and I should have charged more for each copy. As my next Kickstarter rapidly approaches, I’m keeping these lessons in mind. The goal of the campaign will be lower, the cost to manufacture each copy will be less, and the price I charge will be more financially responsible. If all goes to plan, I will not be spending a ton of my own money to make and ship the game, so it shouldn’t take selling half of the inventory to start making money. Stay tuned… there are very exciting things on the horizon! Very interesting. Thanks for your transparency about your process. I can’t decide if it gives me hope or despair about the future of indie board game publishers!